The Business Hotel Has 11 Floors and Air Conditioning in Common Areas. It is an Ideal Alternative For Both Tourism and Business Trips. 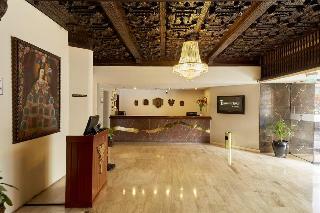 The Hotel Has a Colonial Design and Features Wooden Ceilings and Chandeliers. It Offers Guests a Lobby Where They Can Relax. In Addition the Hotel Features a Business Centre Which Offers Internet Access and Faxing Services. There is a Beauty Salon Located On the Premises. Renovated in 2009, the Conference Hotel Offers 99 Rooms and Further Facilities Include 24-Hour Reception and Check-Out Services, a Hotel Safe, Currency Exchange Facilities, a Cloakroom and Lift Access. Guests May Also Chance Their Luck in the Casino, Enjoy a Drink in the Cafe or Bar, or Dine in the On-Site Restaurant. Room and Laundry Services, a Car Park and a Garage Are Also Available. The Members of Staff At the Hotel Speak Both English and Spanish.